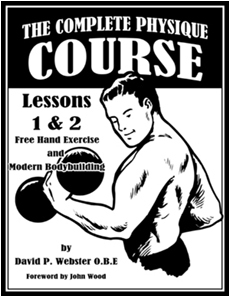 Alan Calvert, founder of The Milo Barbell Company, was a prolific strength author who wrote an untild number of courses and articles. He rarely featured himself though, but this is an exception: a rare image of a young Alan Calvert in mid-swing with an excellent Milo globe dumbbell. This would be circa 1902. Dig those gladiator boots! There have been more than a few great strongmen who are not giants. A perfect example is Robert B. Snyder of Hagerstown, Maryland. As a boy he was inspired by the strongman from the Forepaugh & Sells circus and began training by lifting barrels and stones. He also taught himself hand balancing – something which he would become exceptionally good at. 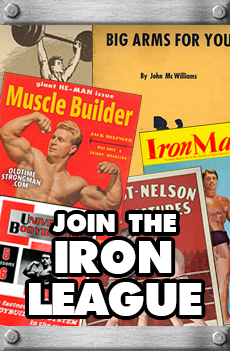 At the age of 14 (weighing 116 pounds) Snyder lifted his first barbell — a MILO barbell owned by a local strongman. Shortly afterward, Snyder began following MILO barbell course #1 and showed tremendous improvement… so much so that he was featured in Bernarr MacFadden’s Physical Culture Magazine as well as Alan Calvert’s STRENGTH Magazine. At his heaviest, Snyder weighed only 139 pounds yet was incredibly strong easily performing multiple one-arm chins with each hand as well as lifting poundages well above bodyweight. Above, Snyder performs the one-arm get up lift with a human weight. 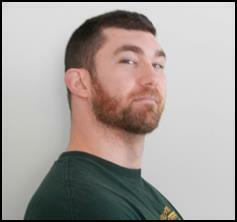 A very rare picture of Milo Barbell Company founder and noted strength author Alan Calvert. Calvert established the Milo Barbell company in 1902, one of the very first training publications “Strength” Magazine in 1914, wrote several training books and courses and helped pave the way for thousands of trainees to develop size and strength. Gotta love those classic ‘bells! 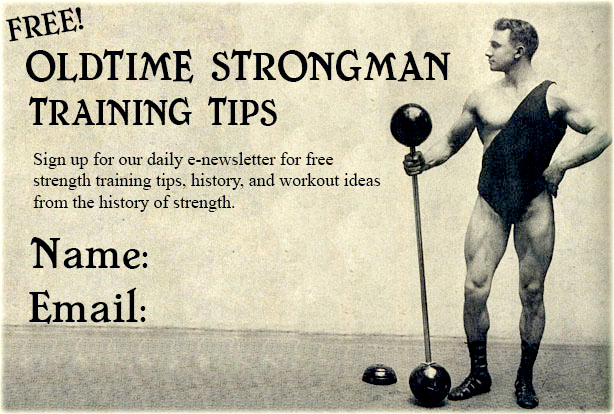 Here’s a look at a vintage ad for the Milo Barbell Company circa 1920. Read the words carefully. Interestingly enough, the messages of proper training and necessity for good equipment have not changed one bit over the last hundred years. Herrmann’s gym, once located at 1325 Chestnut Street in Philadelphia, Pennsylvania, was one of the popular hangouts for many of the strength stars of the early 20th century, most notably Sig Klein and Milo Steinborn, who performed a number of strength feats there. Sandow trained at Herrmann’s place whenever he visited the US. At Hermann’s, classes were taught in boxing, wrestling, fencing, body-building, calisthenics, Indian Clubs, gymnastics and acrobatics. This picture was taken in 1931 and shows Milo Steinborn getting in a quick workout on the newly added open-air section of the gym (used for hand ball and training in the fresh air and sun shine, among other pursuits.) Herrmann’s son (also named William) won the bronze medal in tumbling at the 1932 Olympic Games in Los Angeles.